The bright light from heaven provides top lighting from above this scene, with the cross of Jesus providing additional white light rays. The secondary source of yellow/orange lighting comes from the flames of hell, the glow of which can just be seen on the edges of the cliff like chasm rocks & foreground figures of Lazarus & Abraham. I have added radiating light rays & a comic-book-like “zap” coming from a point at the centre of the cross, which represents the dazzling brightness of, & centrality of, the cross of Jesus. In one of the previous scenes (Luke 16 – Rich man & Lazarus – Scene 05 – Great chasm) we only saw the cast shadow of the cross, without the cross itself. In this last scene in the series I was keen to show the shadow’s source: the cross of Jesus. 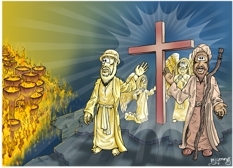 From left to right, the soul/spirit of Lazarus, looking towards the Rich man in hell, with his left arm gesturing back towards the cross of Jesus. Next there are 2 angels, one kneeling, the other standing, at the foot of the cross. Finally we see the soul/spirit of Abraham on the right of the scene, gesturing back to the cross & forward, towards the viewer. He has his staff resting against his outstretched shoulder. The Rich man (in Hell) is unseen, off beyond the left hand edge of this scene. This Colour version has the blue shadow overlay removed, so that the viewer sees the full colours of the figures, without shadows on them. The cast shadow of the cross on the foreground rocks is rather more subtle in this version than in the Blue version. I copied the fire, flames, “cups”, glow & other elements from a previous scene in this series (Luke 16 – Rich man & Lazarus – Scene 05 – Great chasm) & cropped it, so that it would fit into the left hand side of this scene, which saved me some time as I didn’t have to re-draw & re-colour that part of the picture! Everything else in this scene is unique, although I used the same colour palette as in previous scenes in this series, which helps to maintain the continuity between the scenes.